California Gold Rush era started in 1848 when an American carpenter named James Marshall discovered the very first gold nuggets at Sutter’s Mill in California. 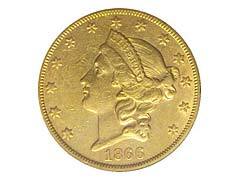 This event had tremendous impact on the overall history of America and California gold coins in particular. Starting from 1849, thousands of fortune seekers started flocking to the banks of California by foot, in ships and on horses in hopes to become rich and famous. Practically overnight, a small Spanish settlement called San Francisco became the center of gold mining industry. Thousands of new settlers needed not only basic commodities, food and supplies but occasional entertainment that a few saloons and dance halls provided. A sudden urge for gold dollar coins as means of payment emerged that could no longer be satisfied by paper money or a rather scarce supply of Spanish and early American coins. At times, miners had to pay for their portion of whiskey or food from a general store with pinches of gold dust which was rather impractical. This gold coin crisis naturally led to the appearance of the first California gold coins that were produced by a few private mints. These private mints melted raw gold to make California gold coins of assorted denominations to satisfy incredible demand for coin currency as means of payment among merchants and miners. Nowadays California old gold coins are considered one of the rarest and most prized gold coins one can add to his collection due to the fact that majority of these coins had succumbed to heavy circulation and did not survive. Only a small fraction of California gold coins still exist as a valuable legacy from Gold Rush times. Information on California old coins and their value could be obtained from some antique stores or coin dealers; however, the best place to find historical coins remains eBay, an internet auction portal. eBay gold coins are presented in a wide selection of denominations and time periods by a large number of trustworthy seller’s from all over the world. There’s a great deal of confusion that a novice numismatist may stumble upon trying to add such coins to their collection, namely, telling California tokens and coins apart. Since the tokens look very much similar to their “coin” counterparts, unethical dealers may try to sell you tokens in place of coins since the latter ones cost considerably more. The tokens are manufactured from 10 karat gold purity and bear images very similar to those of the coins, it’s important to study images of actual coins to avoid unpleasant predicaments.